Pebble says the firm's new smartwatch, due Q1 next year (much like the Apple Watch) will be, "More everything... more beautiful, more thin... Just say 'more' then insert adjectives." While at pains to make clear that she couldn't tell us anything more specific about the successor to the Pebble Steel, Pebble "evangelist" Myriam Joire revealed that it would be highly customisable – above and beyond the current choices of plastic or metal body and a selection of straps. Asked if this would include modular components, as on the forthcoming Blocks wearable, she said "It may do... Or it may not". So there you go. That aside, the next-gen wearable will be "an evolution not a revolution" but with "some revolutionary elements." She implied that the Pebble's distinctive e-ink screen would remain, saying, "It's always on and it gives us great battery life… Sure, we'd love to have an AMOLED screen but that wouldn't deliver great battery life. Moore's Law will eventually solve this problem, though." On the topic of Apple's forthcoming competitor product, former Engadget mobile editor Myriam had plenty of interesting thoughts. She predicts that the gold versions, "will be around $10,000," and questioned whether the kind of watch-loving, wealthy customer who Apple would be pitching such a thing to would be willing to pay that amount for a device that can't be passed on to the next generation, in the way that they would a Patek Philippe. She also asserted that the recent Apple wearable hype-fest had caused Pebble sales to rise, asthe mass market became more aware of smart watches, and went in search of one they could buy right away. The Pebble Steel is also significantly cheaper than Apple's. "I don't think Apple sees us as a competitor," Myriam concluded, citing the "four pillars" of Pebble's brand as being lengthy battery life, multi-OS compatibility, affordability and waterproofing. 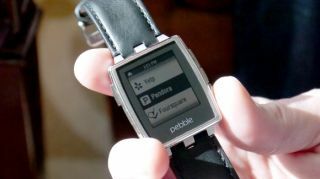 She also suggested that Pebble may soon take its platform onto other devices, saying, "we're a wearables company, not a watch company."